Three-Minute Fiction: Snowflake She found the photograph early in the day, while she was cleaning for spring, pulling a winter's collection of domestic detritus out from under the bed. Ticket stubs, grimy grocery notes, coffee-stained lined paper, and dead pens. Their life: movies, food, and books. She found the photograph early in the day, while she was cleaning for spring, pulling a winter's collection of domestic detritus out from under the bed. Ticket stubs, grimy grocery notes, coffee-stained lined paper, and dead pens. Their life: movies, food, and books. She didn't like housecleaning, but the weather had changed, and something moved her to sweep around, put things in order, clean them up. The picture was caught in a constellation of cobwebs — a business card, she thought, or an ignored invitation — until she pulled it toward her and saw that its white corner was part of the frame of a creased print, a photograph of two happy people in holiday clothing. 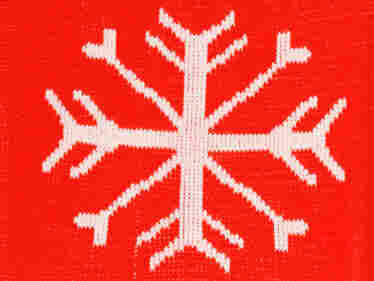 One was her husband, looking festive; the other, a women she had never seen before, who was wearing a sweater knitted with falling snowflakes, white on a deep red. The petals of a yellow-centered poinsettia reached across her chest, avoiding the flakes, which floated around the front of her. He had a drink in his hand. They were looking at each other, smiling. She pushed the picture into her pocket and began rehearsing what she would do. She would leave it on his dresser; she would leave it on the coffee table, the kitchen table, on his dinner plate. She would thrust it toward him, throw it at him, wave it in the air where he could not see it clearly and grill him. Who the hell is this? Where were you? When was this? No. She would not complain, she would not confront, not again. She kept close track of the photograph as she cleaned her way through the afternoon, checking, now and again to make sure it hadn't fallen, patting it on her hip, continuing to sweep, opening the windows, and airing things out. The temptation to pull the picture out and stare at it grew enormous, but she would not allow it to put a chill on what had been the promises of a pleasant day. The picture was hers, now, and she would do what she pleased. He called and said he'd be late. Again. Not to worry about dinner — just suit herself. She did. He didn't know; she was not going to tell him. She finished washing the kitchen windows and went upstairs. Sweaty and grimy, her hands black from newsprint, she stripped and showered. She set the photograph under a towel, in the off-chance he would come home before she was ready. He didn't. She was clean and cool off before she went downstairs. She opened the catch-all drawer and took a sharp pair of kitchen shears, a hole-punch, and a short piece of thin red ribbon from among a clutter of occasionally used utensils and folded the picture, crease-by-sharp crease, into eight segments; she clipped off the outside edges. The emulsion, already cracking, began to slip from its backing. She opened the snowflake, red and green on one side, with a flash of skin-tone and the gold of an earring, and white on the other. The original picture was undiscernable — reduced to a confetti-like holiday pattern. She punched a hole on one edge and ran the ribbon through. She swept up the extra little pieces and slipped them into the trash. The sun turned yellow, then orange; it caught the small sections of the picture's shiny surface, which picked up its day's end warm colors. She tacked the snowflake to a muntin of an open kitchen window. A slight breeze came up and shifted it back and forth. The picture was hers, now, and she would say nothing.